When Sen. Ron Wyden, D-Ore., formed a partnership last December with House Budget Committee Chairman Paul Ryan on a Medicare redesign, some Democrats grumbled in dismay. 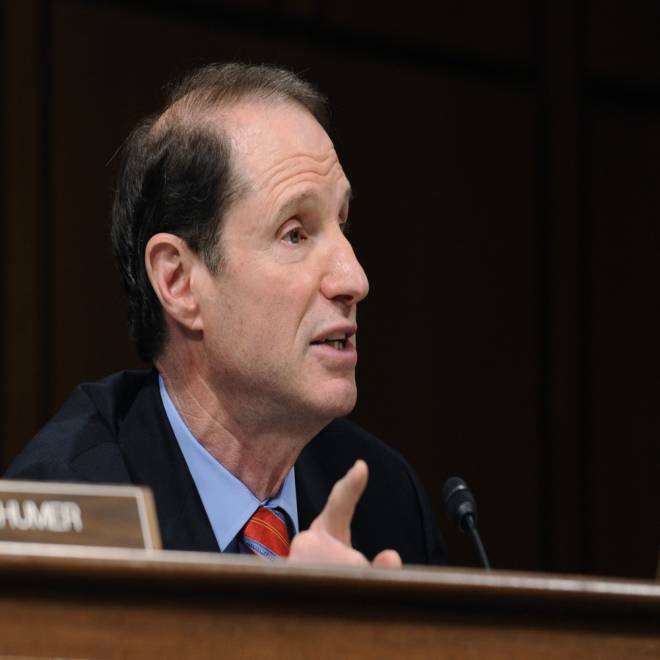 Sen. Ron Wyden, D-Ore., in the past has called for a fundamental restructuring of the Medicare entitlement. The Oregon Democrat joined the Wisconsin Republican in calling for a fundamental restructuring of the Medicare entitlement. Sitting next to Ryan at the Bipartisan Policy Center event, Wyden said, “There’s a window of opportunity here, a chance to change the conversation, lower the decibel level ... and see if we can bring together progressives and conservatives” to create a system in which people on Medicare choose a private-sector health plan or traditional Medicare, if they want. As NBC's Chuck Todd reports, the battle is on to define Rep. Paul Ryan with Democrats trying to paint him as an ideological warrior determined to end Medicare and Republicans trying to sell him as the serious candidate with an intelligent plan to get the country out of debt. If the cost containment built into the Wyden-Ryan plan works, as they think it will, then a device such as the Independent Payment Advisory Board – the outside panel of cost cutters set up by the Affordable Care Act – “almost becomes irrelevant,” Wyden said. Wasn’t Wyden, some Democrats asked, giving political cover to Ryan, the Republican leader on budget and spending issues? And why was he doing that? The questions seemed especially pointed, given that only six months earlier, Democrats had successfully used the Ryan budget proposal – including his ideas for redesigning Medicare – as an issue to help defeat Republican Jane Corwin in a special House election in upstate New York. The Daily Rundown's Chuck Todd explains how the race to define Paul Ryan will move to five battleground states Tuesday. The Wyden-Ryan plan would “undermine rather than strengthen Medicare," White House Press Secretary Jay Carney told a Dec. 15 news conference. Now that Ryan is Mitt Romney’s running mate, those Democrats might have even more reason to grumble, especially if Romney keeps using Wyden’s collaboration with Ryan as a symbol of courageous bipartisanship, as he did on Monday in Miami. After Romney touted the Wyden-Ryan partnership on Saturday, saying that Ryan had “found a Democrat to co-lead a piece of legislation” to save Medicare, Wyden issued a statement to rebut Romney on this point. Wyden’s sudden prominence in the 2012 campaign makes it all the more important to be clear about exactly what the Oregon Democrat has and has not endorsed. Wyden did join with Ryan in proposing changes in Medicare that would allow people enrolled in the program to choose from among insurance plans offered by private sector insurers. People in Medicare would get “premium support” payments from the government to help pay the premiums in those privately-run Medicare plans. He emphasized that Wyden-Ryan wasn’t a finished piece of legislation but “simply a policy paper intended to start a conversation” about how Democrats and Republicans could restructure Medicare. One reason Wyden voted “no” on Ryan’s budget – even though he’d worked with Ryan on Medicare redesign – is that other federal entitlement program that is crucial to the ailing elderly: Medicaid, which covers the cost of nursing home care for elderly and disabled people. The Ryan budget turned over the federal share of Medicaid payments to the states – “block-granting” in budget lingo – allowing each state to tailor its own Medicaid program to suit its population, but also reducing program outlays. Wyden complained that Ryan and other Republicans made a mistake in trying to alter Medicaid. “By block-granting Medicaid, they put at risk the most vulnerable seniors, the seniors who need nursing home care that is paid for by Medicaid, and since Medicaid is a Federal-State program, by block-granting it, we put at risk the most vulnerable seniors,” he said on the Senate floor. Democratic strategists think the same game plan that they used to beat Corwin in that New York special election last year can work against other Republicans this fall – especially those who’re on the record having voted for Ryan’s fiscal year 2013 budget blueprint. But for some Democrats, Wyden’s willingness to join Ryan in arguing that “a model driven by choices and competition” will work and “makes some of the old discussion potentially irrelevant” – is, at best, a kind of off-message dissonance and at worst a form of heresy.